Background: The purpose of this investigation was to determine if Army Special Operation Forces (ARSOF) Operators who participate in the Tactical Human Optimization, Rapid Rehabilitation and Reconditioning program perform significantly better on a simulated stress shoot scenario than ARSOF Operators who do not participate in the program. 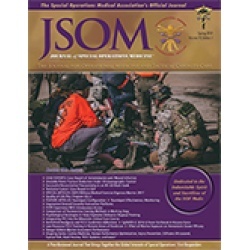 Methods: Deidentified archival data from 64 male ARSOF Operators (mean ± standard deviation: age, 31.1 ± 4.96 years; SOF experience, 3.44 ± 4.10 years) who participated in the Special Forces Advanced Urban Combat stress shoot were assessed to determine if differences in performance existed between program users (n = 25) and nonusers (n = 39). A series of bootstrapped analyses of variance in conjunction with effect-size calculations was conducted to determine if significant mean score differences existed between users and nonusers on raw and total course completion times, high-value target acquisition (positive identification time), and penalties accrued. Results: Small to medium effect sizes were observed between users and nonusers in raw time, penalties, and total time. Although there were no significant differences between users and nonusers, there was less variation in raw time and total time in users compared with nonusers. Conclusion: Our findings becomes a question of practical versus statistical significance, because less performance variability while under physical and psychological duress could be life saving for ARSOF Operators.